When I read Amy Monticello’s first nonfiction essay chapbook Close Quarters, I knew I wanted to review it for The Nervous Breakdown. But the project included a few complicating details: First, I know Amy personally. Rather than simply reviewing the book, I thought it made sense to be upfront about our personal relationship, and incorporate conversation with Amy into my review. Second: Amy is also a TNB author, so in the tradition of the TNB self-interview, we decided to do something a little different: a reverse interview. Below are the author’s questions about her own book, and one reader’s answers. AMY MONTICELLO: Writer Rebecca Barry, who kindly blurbed CQ, once commented that the book takes an interesting risk regarding alcohol–that it contributed to my parents’ divorce, yet helped keep them bound to one another. It was challenging to write about the world of my father’s bar without inadvertently glorifying or demonizing alcohol. How do you see this operating (or not) in the book? MARISSA LANDRIGAN: The risk Close Quarters takes with regard to alcohol is to tell the truth about alcohol straight on – to show us the damaging potential inherent in soaking your heartbreak in alcohol, while being willing to admit we all fall prey to its consolation. The cool comfort of a beer bottle, the sturdiness of a thick-bottomed glass full of a couple ice cubes and two fingers of something dark, the warm headache of red wine. These are familiar sensations to all of us, and CQ doesn’t shy away from letting us see both the good and the bad. One of my favorite moments in the book, a boiling point of its consistent pressure-cooker tension, centers on the blackness that alcohol can bring out. Late in the essay “The Other Woman,” Linda Jackson, Danny’s ex-mistress, corners him and Amy-as-narrator in the kitchen of Danny’s bar, sloppy and drunk. Her consumption is ever-present throughout the essay, like a lapping wave building into a subtle roar. You know someone will say something their regret in that kitchen. In moments like this, dropped with excruciating precision, we hate alcohol. We sneer at the despicable things people do when they’re drunk: the small missteps and big hurts that comprise so much of the damage in the story of this family. But you don’t let us off the hook that easily. Because everyone has a glass of something in their hands most of the time, even at their most sympathetic (or pathetic) moments. We see the tenderness between Amy-as-narrator and her father when they can finally share a drink, the way they are able to talk to each other openly in the way fathers and daughters always struggle to do, and we cheer for alcohol in those moments. We see the heartbroken nurse themselves with alcohol, and we remember how we all need that blankness sometimes. In many ways, this is the struggle — and success — of any good work of creative nonfiction. To give us raw humans, with their flaws, and their demons, and their broken hearts, to allow us to hope endlessly for redemption that only sometimes comes. It was another risk to try and tell some of the narratives from one or another parent’s point of view. While all the major events in the book have been verified by my parents, I do often imagine the details–facial expressions, clothing–and, occasionally, motivations. How ethical or reasonable is it for nonfiction writers to slip into any POV other than their own? What was accomplished by looking at stories through my parents’ perspectives? What might have been lost? One of my favorite things about the book was how fair the issue of point of view felt. I got the sense that at some point, you looked over the developing collection and thought: Okay, I need three for Mom, three for Dad, and they all have to have some good and some bad. This may only be my writer neuroses. Perhaps the essays in the collection shook out this way on their own, perfectly naturally. In fact, I wonder if the equitable distribution of who-gets-what-story here is a product of your intimacy with the subject matter. You know these characters so well. They aren’t characters to you—they are your family, and who better than a daughter to let us see the dark sides and the light? The flip in there towards “though that’s the thing he doesn’t know,” floored me. It’s so honest and so quiet a revelation of the presence of you, the author, the daughter-to-be, in the midst of this internal monologue of your father. I think those little clues you give us (and others that are meant to be more obvious) keep the imagined, hoped, forgiven perspectives of your parents ethical. You’re telling us, even if you wish you didn’t have to, that this is all your version of the story, the one you’ve been trying to piece together your whole life. Though maybe I’m completely wrong, and this is always my biggest fear as a nonfiction writer whose work often includes my family, my friends, my relationships. What do your parents think of your take on things? When I was growing up, my family’s nickname for me was Sarah Bernhardt. It was meant to capture my penchant for melodrama–the tantrums and obsessions, the staunch belief that a situation with which I was unhappy would never change, never allow for happiness in a new permutation. As a writer, I always fear crossing this line into melodrama, or sentimentality, especially when writing about love. Does the book successfully toe this line? What strategies can writers take to capture the high emotions of our lives without sounding melodramatic? You know, we have really similar approaches to nonfiction, and I think neither of us is afraid to become weepy, or celebratory, or enraged, when the situation calls for it. Life is big and messy and over-the-top sometimes. I might be an unreliable reviewer here, because I like sentimentality and melodrama. Well, I guess that’s not entirely true. There must be a particular kind of it I like, because I don’t watch reality TV or read Harlequin romance novels, and both of those are pretty melodramatic genres. He goes on to describe a number of powerful literary moments that would be flat and dull without their use of melodrama — Hamlet’s descent into madness, Madame Ravensky mourning the loss of The Cherry Orchard, Bruce Springsteen’s plaintive “whoa whoa whoa” in the middle of the song “Badlands,” (that’s a literary reference!). These moments, Dean says, don’t just rely on melodrama—they require it. Without what he calls “the lyricism of upheaval,” we would never truly understand the pain these characters are so desperately fighting their ways through. Now all that being said, I think the book is still remarkably restrained when it needs to be. The whole of “Christmas 1984” is just a silent observation — practically an ethnography of your family at a moment in time. You give the reader the indication of your presence. You tell us Amy-as-narrator is listening to this tape in the present, with her mother and husband, you comment on the events, tone, soon-to-be reality of the recording. You tell us that you all need wine to listen, and that you are ‘clutching’ those glasses, which tells us this is a difficult endeavor, the remembering. But you don’t tell us how it feels to listen. You don’t openly mourn the loss you know is about to happen. You don’t tell us you or your mother has tears beading up in her eyes at the tenderness of the memory. You play the tape and then you shut it off. And that’s just as killer. So I think it’s in making those conscious choices — when to show us Amy-as-narrator railing and floundering against what’s happening to the stability of her world, and when to shut it off — that is the only strategy for writing this kind of internally-driven emotional narrative. In an age where marriage as a cultural institution is undergoing a makeover, become more inclusive and complex in its possible definitions, why do I care about my parents’ divorce? What could it possibly teach me about going forward in my generation’s own version of partnership? As a child of roughly the same age, whose parents are still together (though not easily, and not without great hurt — more on that later), I grew up in a world where divorce was ever-present, but distant. Separate from my own experience. I had lots of friends whose parents were divorced, who showed me a variety of versions of that: little girls who, at age 10, swore they would never get married; thirteen-year-olds who dated seventeen-year-olds and smoked cigarettes behind the Mobile station after school; perfectly well-adjusted high-schoolers. Some of my classmates married young. Some haven’t yet. What I mean is that divorce seemed to me to be the norm growing up. So much so that once, after overhearing a particularly messy fight between my parents, I told my sisters I wished they would just get divorced already. I was fully prepared — some days, eager — for that to happen. What does it mean that your parents did? What does it mean that my parents didn’t? I think in some ways, the rise and fall of the nuclear family is a great gift our parents’ generation gave to us (right here, I am confirming the worst fears of every right-wing PAC). They showed us we don’t have to do anything. I love the moment in “The North Side,” where you recall your mother telling you she left your father “because she could.” There is wonderful autonomy in this story, in the wide open spaces of anything’s possible, for all its heartache. Perhaps the redemption available here is the lesson that we can build love our own way. What do you think of nonfiction chapbooks? Since essayists and memoirists lack a novella-length form, could the chapbook stand in? If so, should nonfiction writers consider writing them as deliberately as fiction writers do novellas, or, as chapbooks have traditionally been used, as a way to publish excerpts from longer works-in-progress? I think the arc of Close Quarters is so precise, so accurate. I can’t imagine it in a form much longer or more widespread — which is strange, considering what an enormous story it truly is. Thinking back to the question of point of view, it would certainly have been ethically easier to handle had you accounted for all of the available perspectives on each memory, which would have ballooned the manuscript much larger. But somehow this doesn’t strike me as that book. This book is the story, as I said earlier, of your take on how your parents loved and left and love each other. If it had attempted to be an essay collection about modern marriage, a memoir of your childhood as a product of divorced parents, a cultural analysis of the 1990s suburban family, it would have been much longer, but it wouldn’t be Close Quarters. It would be something else. I think the chapbook then, offers us nonfiction writers a length and a specific boundary in which to place our stories just so. Rather than treating is as a sort-of scrap bin for the remnants of a longer work that just don’t quite belong, we can do more (and maintain a better reputation for the genre) by seeing those remnants as an entity. Perhaps the book began as a series of castoffs — but it should ideally develop into a thing of its own. A quilt, I guess, so as not to drop that metaphor. I think every writer is interested in what their readers thought while reading their book. And I don’t mean this in terms of like/dislike. I mean, what do my readers think about from their own lives? Their own families? Their own ideas of partnership? Their own relationships with their parents? What, if any, memories did the book dredge up for you, Marissa? I should’ve known better than to trust a nonfiction writer not to do this. This is the most subversive part of this whole exercise, here, where you, the author, have turned the tables, have insisted that I, the reader, reveal something of myself. Like an offering. What will I give you in exchange for all your hurt you’ve shown me? I suppose on the one hand, your parents’ story offers me something of a “what could have been.” All those nights I imagined my parents divorcing — how I would want to live with my father and would get to re-do the décor of my bedroom in a second house; whether my sisters and I would be on the same schedule; worried my mother would become more volatile, or less, worried she would disappear; worried my father wouldn’t eat right — this is like that reality played out voyeuristicly, like at a drive-in movie, just far away enough to know that it’s not really happening to you. But I’m a nonfiction writer, too, so I have to be honest here. What I thought of most while reading Close Quarters was the end of my last relationship. I will talk about it in abstractions, for the sake of others involved. I’m still lost in the mourning period of it, in the certainty that we came thisclose to figuring it all out, to getting it right. Even more than a year after the end of that relationship, I am still consumed with thinking about it. He’s lodged in my brain like a puzzle – like, actually, a Rubik’s cube. Something impossible to understand but impossible to put down. Maddening. Compelling. And that seems to me to be the enduring question of Close Quarters: where and when and how, exactly, did it all go wrong? Why you are so compelled by the story of your parent’s divorce—because you know there’s something for you to learn in there. How to avoid being too sentimental—by looking critically, by treating the story as if it were an artifact, a specimen to be dissected. What you gain and lose by going into your parents’ minds and switching perspectives—their inner lives, the true parts from which you sense they may have tried to shield you. What role does alcohol play and how can you honestly deal with it—maybe the presence of alcohol is what allowed everyone here to say all that they needed to for you to write this book; or maybe, it’s what will keep you from ever knowing if you got the whole story, right. That’s what I think of when I read Close Quarters, that’s why it aches so bad in me. It’s a question and the answer to the question: Why it works or why it doesn’t? You will never know. You will never know. You can’t. 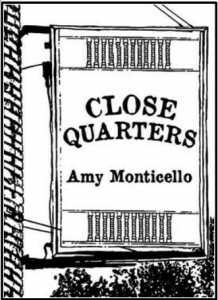 Amy Monticello’s Close Quarters is available for order from Sweet Publications. What a great concept. Just ordered the book. Zoe, I love your work, so that’s a huge honor. Thank you so much.